When Did Lois and Clark First Kiss? It didn't take Lois long to fall in love with the Man of Steel. 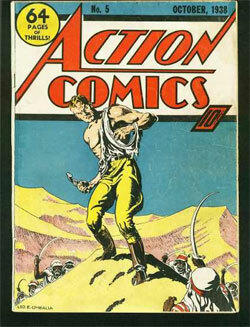 In "Action Comics #5" (October 1938) Superman saves both Lois and a town from a flood. 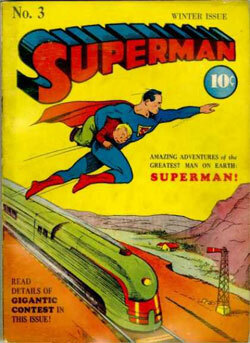 [Note: The story was later reprinted in "Superman #3" in 1940]. Lois says, "You did it! You saved all those people -- OH, I could kiss you." Next frame she wraps her arms around a startled Superman's neck and says, "As matter of fact, I WILL." To which Superman replies, "Lady PLEASE." Next frame sees a smug Superman cradling Lois and saying, "WOW! -- What a kiss." In which she replies, "A super-kiss for a Super-Man." As far as we've been able to discover, this is the first time in any medium (comics, TV, radio, cartoon, movies) that Superman and Lois Lane shared a kiss. Thanks to Grant Bywaters for helping research this information. Did you know that in "Action Comics #306" (1963) Clark finds himself under the mistletoe with Lois at the Daily Planet Christmas party and decides to shock the daylights out of her by giving her a super-kiss, instead of a mild-mannered kiss she might expect from Clark.